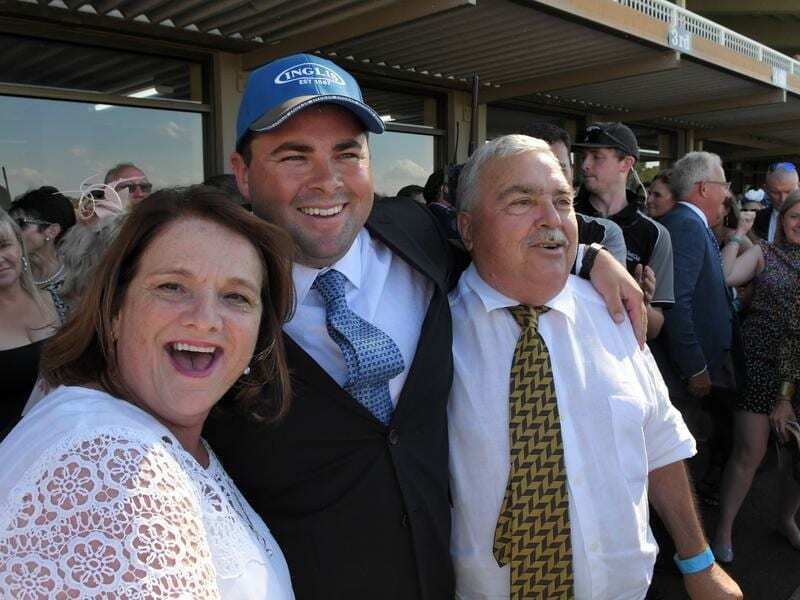 Richard Litt (centre) has celebrated the biggest win of his training career with Castelvecchio. Richard Litt’s perseverance in the tough Sydney training arena has reaped its biggest reward yet with Castelvecchio’s win in the $2 million Inglis Millennium at Warwick Farm. The 29-year-old has been flying solo since his father Jim, who set up the Warwick Farm stable, returned to New Zealand three years ago after the death of Richard’s brother Jay. Having been kept afloat mainly with tried horses, Litt came by $150,000 yearling Castelvecchio when he was entrusted to him by owner Ottavio Galletta. The two-year-old colt signalled his ability when he won at Canterbury on debut but was up against the big stables on Saturday with the Chris Waller-trained Accession ($2.40) and Dawn Passage ($2.70) from the Gai Waterhouse and Adrian Bott stable, dominating the market. On the track it was Castelvecchio ($21) who dominated, charging to the line two lengths ahead of Accession at the end of the 1200m with Dawn Passage another three-quarters of a length third. “This is what we get up for. This horse he’s the real deal,” Litt said. “Ottavio bought him and sent him to me thank God and we just loved him. Josh Parr rode Castelvecchio to his first win and said the colt had untapped ability. “He is so raw. He’s got no idea what this is all about. It’s just sheer ability,” he said. “I’m so thrilled to win for Richard. He is a young trainer..He’s a nice guy trying to make his way in an extremely difficult world. The TAB immediately slashed Castelvecchio’s price for the $3.5 million Golden Slipper (1200m) on March 23 from $101 to $15. The prize money from the sales-restricted Inglis Millennium does not count towards a Slipper start with Castelvecchio earning $22,000 for his Canterbury win. Litt said he would discuss the Slipper with Galletta but was reluctant to rush the colt into trying to qualify and the Sires’ Produce Stakes (1400m) might be a better target.